Are you interested in bringing your car along while your are out road tripping in your RV? This is a pretty common practice among RVers who drive motorhomes. Mainly because breaking camp and driving the big RV every time you want to go to the store or sightseeing is huge hassle. Not to mention impractical. 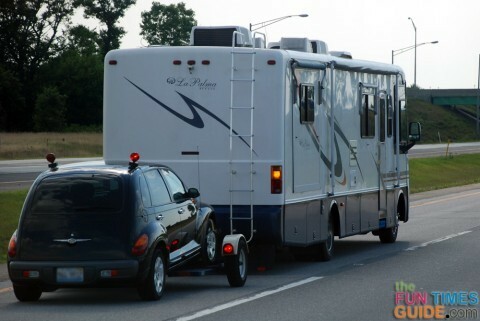 The two most popular methods of towing a car behind you RV is to flat tow it, or put it on a RV two dolly. Flat towing is convenient because it requires no extra parts that must be stored at the campsite. tThe major drawback is that not all cars can be safely flat towed. In this case, a dolly is your best option. An RV tow dolly is a small, 2-wheel trailer that is specifically designed to tow automobiles. Basically, it carries the front wheels of your car while the back wheels remain on the road. Since most modern cars have front wheel drive, their drive trains will remain motionless. That means no mileage will accumulate on the odometer, and your car won’t incur wear and tear. Which leads us the question, how do you choose a RV tow dolly? First of all, it’s important to remember that not all tow dollies are not created equal. There are many factors to consider before spending your money on dolly. These are considered to be better quality than the tow dollies listed below. But, to be honest, they only offer one big advantage which is that they reduce the chances of your car hitting your trailer when going around tight corners. All the models listed are good choices. Still, they are considered to be of lesser quality due to their fixed trailer wheels. Their center pivot point is also a factor. When you choose between these two styles of tow dolly, it all comes down to your personal tastes. Also, it is important to note that the tow dollies that you will find in U-Hauls are the center pivot design. I only say this because it seems that if U-Haul, who has liability concerns, uses this version, there’s no need to worry. In other words, they both will do the job they were created to do. Before you choose your tow dolly, there are a couple more things that you must consider. For example, a tow dolly with braking capabilities is required by law in most states. Some tow dollies have electric brakes, like you would find in a standard travel trailer. All you have to do is install a brake controller in your rig and you are ready to go. Other tow dollies have what are called surge brakes. The brakes are activated when the trailer senses that you are about to stop. The biggest benefit of these types of brakes is that they are built into the tow dolly. This means that you won’t need to install any equipment. Another important consideration is lighting. This is also required by law in most states and can usually be found on the fender of the tow dolly. Often, you will need to have operating brakes on the car that you are towing as well. 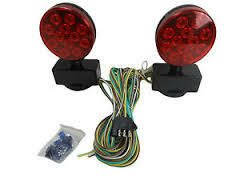 This is achieved by installing wiring that allows your rig control the factory lights on your car. Another option is to buy a removable light system, or bar, that can be attached to the rear of your car. It can be removed when you reach your destination. 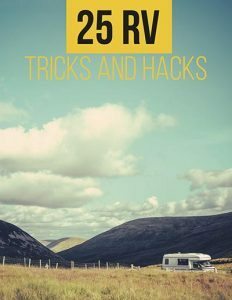 Finally, it’s important that you read the manual of your car before you go out and buy a RV tow dolly. Many of the newer models don’t have a way for you to lock the steering wheel. This is mandatory when using a tow dolly because it prevents your car from drifting back and forth. Otherwise, the side panels can get damaged when you are taking corners. So, if your vehicle doesn’t have the steering wheel lock feature, you shouldn’t tow it with an RV tow dolly. 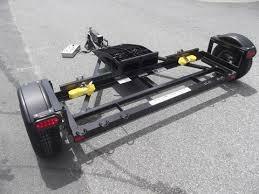 Now that you know just about everything there is to know about RV tow dollies, you can buy a new one with confidence. Happy RVing!